This topic contains 29 replies, has 0 voices, and was last updated by UltimaLink 15 years ago. Ah, another Genesis classic.Here it is, Konami’s Genesis debut, an arcade-style platformer which could be the closest thing to perfection ever to grace the genre. Basically, Zebulos is a kingdom of the opossum species, whereas Devotindos is a kingdom of pigs, in full Disney-style anthropomorphic glory. In some parts it’s original, in some parts it’s cliche, but in all ways it’s fitting, and it drives the game well. Most of the story is told through cutscenes or in a few cases, in-game battles, and there are definitely a few surprises waiting for you near the end. The real star of the story is Axle Gear though. You’ll confront him several times throughout the game, all of which you are severely outgunned. He’s silent, efficient, and always in control, making him one of the better antagonists in the video game world. However, I would never have picked a name like ”Sparkster,” seeing as there’s nothing he does regarding sparks, and it sounds odd anyway. Like boss battles? Hate motonony? 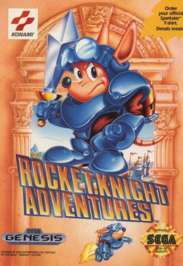 Rocket Knight’s got your number. This game has 7 levels with at least 19 boss battles (which varies by difficulty setting). The bosses come in all shapes, sizes, and difficulty. They really reminisce of classic arcade game boss battles, where the bosses perform routine waves of attacks, all of which require you to stay alert and keep moving, or suffer the consequences. The first times playing through them are definitely the best, as you never truly know what to expect. Many are persistant multi-stage bosses, refusing to die until you’ve put them away for good. While the bosses are definitely the highlight of the game, the rest of the game really shines as well. Except for a few parts of the first level, there is hardly any similarity between how any two parts of the game are played out. In the first level alone, you’ll be be fighting footsoldiers, biped robots, and buggies, not to mention running from a wall of fire, going through a short flight section, learning how to use the rocket pack while ricocheting off walls, and fighting 3 bosses. The gameplay is mainly divided into 3 types of play: swimming, fighting on land, and flying. While swimming and walking, you can charge up your rocket pack and then let loose to go flying in any given direction for a short time, bouncing off walls as you hit them. While on land, you can jump off of the ground, and hang from branches and vines. In all 3 types of play, you can swing your sword to do a bit of damage with the sword itself and send what looks like a disc flying forward, which serves as a projectile attack. The controls are incredibly easy, making the learning curve for the game next to nothing. You also have the standard ”lives and continues” setup of retries, and 8 hearts worth of health to determine how close you are to death. Hearts are taken off in varying amounts depending on what hurts you. Some things take off half a heart, some take off 4 and a half, and some things kill you instantly. Also scattered throughout the world is fruit, which recharges varying amounts of health. There are also 1up’s scattered throughout the game, which are almost all disappointingly obvious and easy to get. Some are hidden well or tricky to get without sacrificing it immediately, but most are simple. Okay, so the slashing doesn’t sound like real slashing, the rocket pack thrusting doesn’t sound like real rocket pack thrusting (not that there IS a real rocket pack thrusting sound) and the explosions don’t sound right either. But all of them are quite satisfactory. The slashing sounds like you’re throwing swords, but that’s not really a bad thing. The explosions are the best I’ve heard on the Genesis next to Contra: Hard Corps. The rocket boosting sound (which you’ll hear quite often) is annoying at first, but gets unnoticeable after an hour or so. Those are pretty much the only sounds aside from a few you’ll only hear once or twice. The voices (actually, pig squeling and rodent squeaking) are very irritating, but that only adds to the humor and feel of the game.Definitely a must play!With all said, RKA is one of the most underrated Genesis games and deserves to be played by everyone.Well, what are you waiting for? Go find a ROM or get the game! and so is yours…but lets not let this go off topic with the first response, talk about the game :? How come your posts aren’t this well written? You aren’t copying this info, are you? I took the PICS from another site…And about the ‘well-written’ part, I just post in mostly lower case and all in normal posts, but for game of the days i make them proper. Chris, you didn’t write that and you know it. That avatar is horrible. It’s all jumpy and hard to look at, it’s like I’m going to get a seizure if I look at it too long. Not to mention it’s not even original, it’s just Cloud and Sephiroth. Your old one was better. I suppose your right…but I wanted a change from that one Ive been using…it was good though.Ill have to look for a better one/or keep that one.Im waiting now on Gary for the file for the avatar since I deleted mine long ago. All I have is the one that I made, I don’t have the original picture anymore, sorry. That was a little too much, especially for 56k’ers…. so I have replaced it with Pupu! You look like a Teletubbie! But, seriously, I just wanted to say that. Perhaps. By the way, congrats on becoming a Bahamut, Gary. Yay, I didn’t notice… 2000 posts… that’s a lot! Well, I’m sure Hayes will have something to say about that. The ultimate “summon” level should be Knights of the Round, or at least Bahamut ZERO. Bahamut is fine. Knights of the Round only appears in one game, Bahamut is in every game and is consistently one of the better summons available. I won’t say anything bad about Gary, he knows he’s the biggest post whore here. I just don’t complain because he runs the place, he can pretty much do whatever he wants. I was the first member, so obviously I have the most posts, but considering when you came to the board, you’re not really that far behind me…. and at least 75% of my whoring is useful, unlike 99.9% of Squier’s posts. unlike 99.9% of Squier’s posts. who squier… no you’re right on the money.